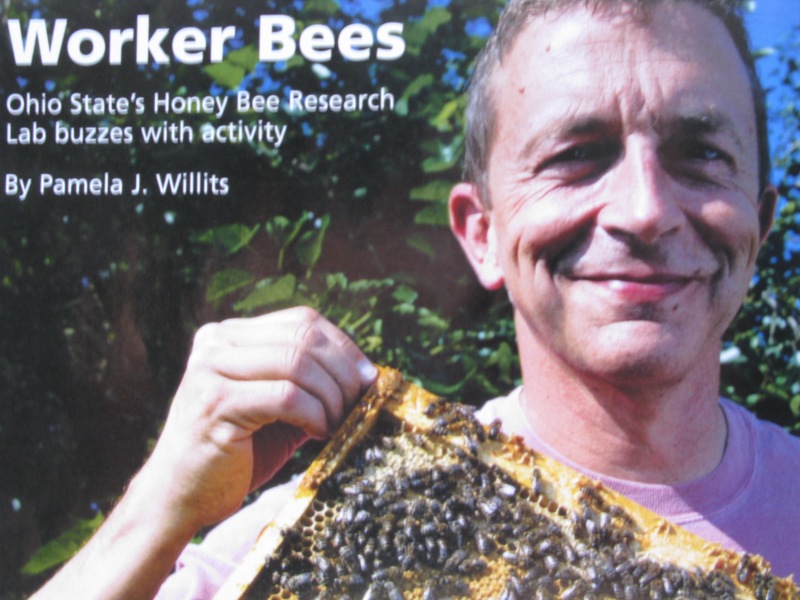 For Brian Smith, director of Ohio State’s Rothenbuhler Honey Bee Research Lab, the value of bees extends well beyond honey. When measured against the insect’s agricultural and scientific value, honey represents a small contribution to the overall economy. The bee’s actual work, gathering nectar, is critical for agriculture. Honey bee pollination contributes more than $14 billion in U.S. agricultural production. “Without bees, crop yields would be minimal” said Smith. The demand for honey bee pollination keeps beekeepers and bees alike on the move. As crops come into flower, farmers rent beehives to place in their fields. To be productive, beekeepers must have quality stock and the bees have to be, well, busy as bees. Not all beekeepers are bee breeders. That’s where Susan Cobey, staff apiarist at the Bee Research Lab, comes in. Of the 200 bee colonies the lab houses, most are New World Carniolan stock developed by Cobey. “As the queen bee naturally mates on the wing-in the air-with several drones at once, it’s not easy to maintain a closed genetic population,” Smith explained. Through instrumental insemination, Cobey has produced a honey bee gene pool bred for disease resistance and productivity. Each summer, she also offers three courses devoted to stock improvement for commercial beekeepers. It’s the similarities between human and bee brain structure that most interests Smith and his fellow researchers. “Unlike human medical research, experimentation with bees can be conducted on neuro-physiological and molecular levels,” Smith said. And given the neurological connection, this makes bees an excellent study model for human health issues. With a grant from the National Science Foundation, researcher Dhruba Naug is using honey bees to study the spread of infectious diseases. Typically, information on the spread of human diseases is limited to secondary observation after a disease has already taken hold and infected large numbers of people. By changing how segments of a bee population interact within a colony, as well as the ratio of younger to older bees, and by selectively infecting only parts of the colony, researchers can observe firsthand how diseases spread. Similar to human populations in large cities, bees live in close quarters. And like humans, bees have natural mechanisms for controlling diseases, such as parasites. “In studying the social structure of bees and how they cope with disease within a colony, we may learn to control the spread of infectious diseases within human populations,” Smith said. Bees may also provide insight into the causes of and possible cures for drug and alcohol addiction. Having a complex social structure, bees normally display fairly sophisticated behavior. “Like human social systems, bee colonies also have rules to adhere by,” Smith said. While it is known that drug-induced, elevated levels of dopamine create the pleasure sensations associated with alcohol and drug use in humans, researchers at the lab hope to understand the molecular mechanics involved in abuse behavior. To keep them from taking flight, the bees are harnessed to small holders, where they willingly drink the ethanol and sucrose cocktail the researchers serve. Once the bees drink a controlled amount, the researchers measure the alcohol concentration in their hemeolymph. It’s the equivalent of measuring blood alcohol levels in humans. The bees are then released, so the researchers can determine changes in their motor skills. “It’s interesting to observe drunk bees: they lie on their backs and wave their legs in the air,” said postdoctoral fellow Julie Mustard. Mustard is quick to point out that there is serious work being done here. By knocking out the brain-signaling pathways in bees, researchers may gain insight into drug-seeking behavior. The results could help reduce drug addiction in humans. Mustard’s grant from the National Institutes for Health funds additional research into the effects of protein levels on the brain’s chemical receptors. “Through a technique called RNA interference, it is possible to regulate gene expression,” she said. Manipulating the chemical structure of a honey bee’s brain may one day result in relief for people suffering from attention deficit disorder or schizophrenia. “I enjoy helping people develop their own research study programs and seeing their ideas develop,” said Smith. He himself is researching olfactory-based learning and memory skills in honey bees, studying their neuropathways and how memory encoding alters these pathways. “Honey bees don’t come into the world preprogrammed knowing everything about their environment. They have to learn which flowers give nectar and which ones don’t,” Smith said. “Developing mathematical models may also provide insight into nervous systems,” said Smith, who has fostered a relationship with Ohio State’s Mathematical Biosciences Institute. He believes that cultivating ties between different fields of study will lead to a greater sense of social responsibility among the applied sciences. It is through this sharing of knowledge that societies – animal and human alike – may benefit. Article originally appeared in The Ohio State Alumni Magazine.